While the Childcare Access and Relief from Expenses (CARE) tax credit from Budget 2019 is very similar in design to what was in the Brown platform (which means the main points from my analysis a few days ago have been reinforced), with the provincial budget now in hand I can make more precise calculations as to who actually benefits. To recap, the CARE credit will let you claim up to $8,000 for child care for kids under 7, or up to $5,000 for kids aged 7 to 16. If your family income is under $20,000, you get back 75% of what you claimed in fees (i.e. $8,000 x 75% = $6,000 for a child younger than 7 years old). The credit is reduced as your family’s income increases, until it completely phases out at $150K. Oddly this is pitched as a low-income program because it is—in theory —most generous for low income families. 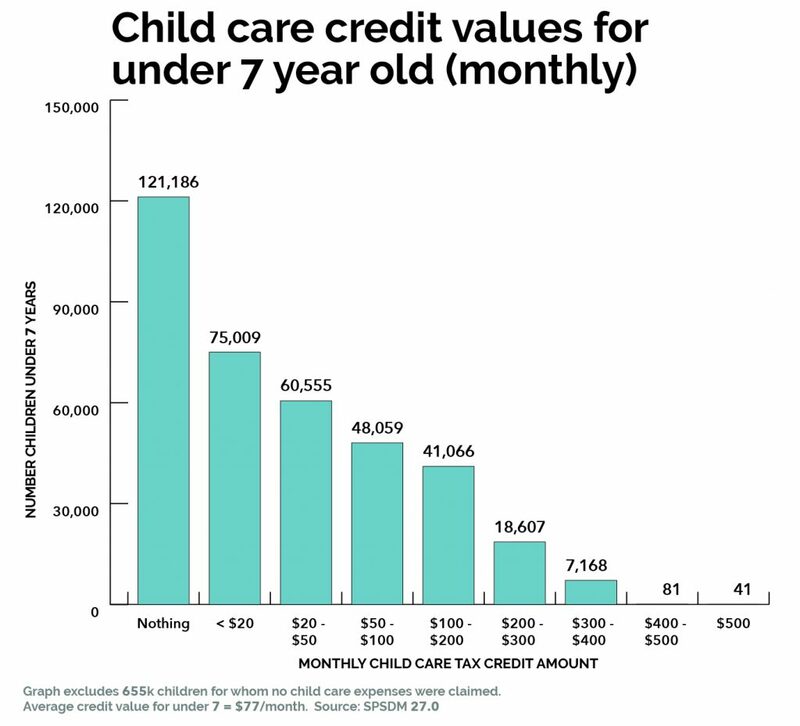 But in the real world, a family making $20,000 is going to have a hard time spending $8,000 of that on child care to get the maximum credit of $6,000. Household budgeting aside, the lowest median fee in any of Ontario’s big cities in any age group is $9,372 a year (for preschoolers in Windsor) and gets as high as $20,220 (for infants in Toronto), far more than maximum that can be claimed through this credit. 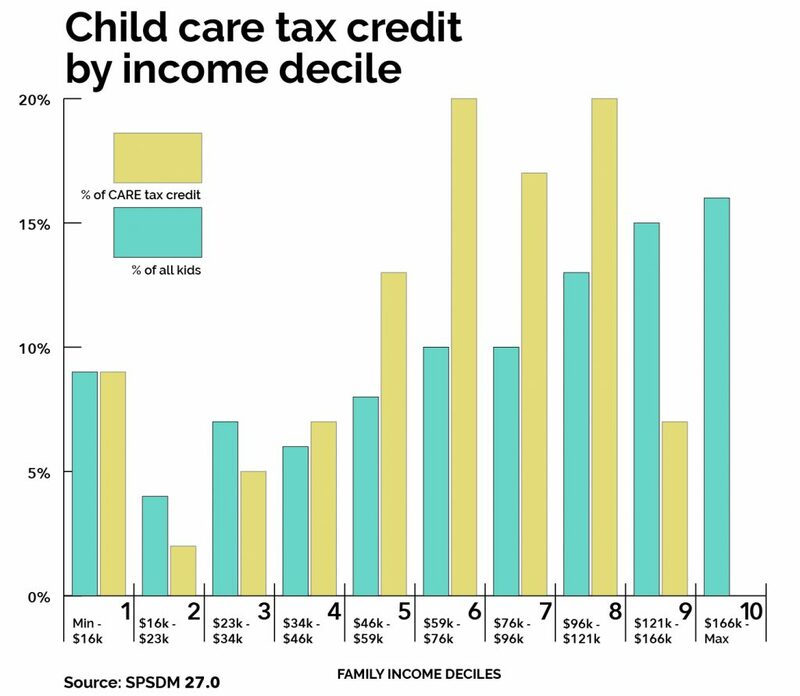 As Figure 1 shows, in the real world no low income or even lower-middle income families can afford the high cost of child care, with or without this tax credit. Thankfully, however, Ontario has the most generous low-income subsidies of any province, making this is a much more accessible and effective option for these families. Incredibly, as Figure 2 indicates below, the structure of this tax credit means only 41 kids in all of Ontario will receive the full $6,000 in benefits ($500 a month). Another 81 lucky kids will get between $400 and $500 a month, while a third of kids will get no benefit and another quarter will get less than $20 a month. So, while the “$6,000 in benefits” figure is being kicked around, only a handful of kids are actually going to receive it. The average benefit for Ontarians with young children who claim any child care expenses will be $52/month. 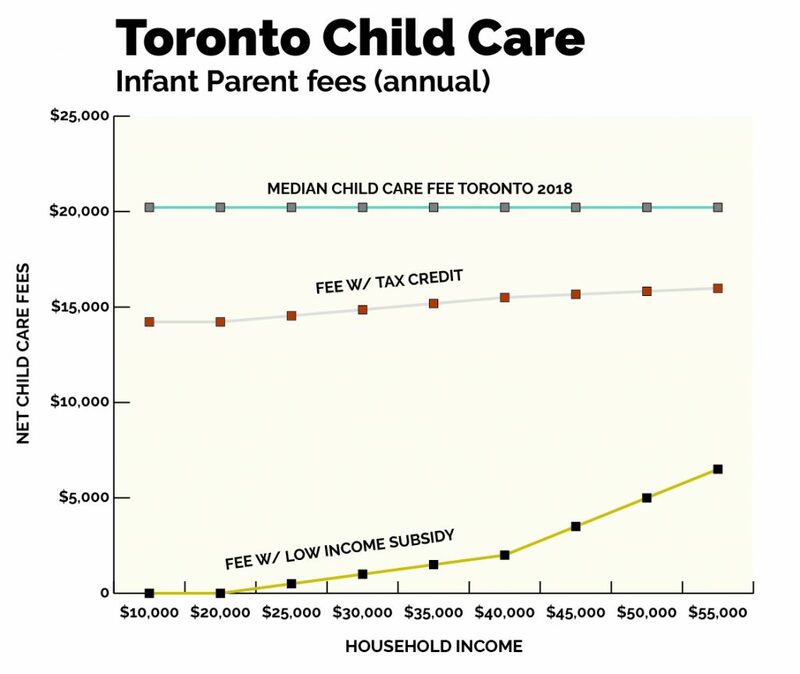 Now compare that to the $1,000 to $1,700 median monthly fees parents pay for child care in Ontario’s big cities. In fairness, the $150,000 phase-out makes the distribution less of a nightmare than most tax credits where the top income earners are vastly over-represented. However, CARE is hardly a boon for low-income families trying to find child care; in fact, the biggest beneficiaries are upper middle-income families. Figure 3 divides families into ten equal groupings based on income. But because not all families have the same number of kids under 17 there are 2 bars, one for proportion of kids (blue) and one for proportion of benefits (orange). Families in income deciles between $46K and $95K are the biggest beneficiaries of this credit with the orange bar (% of benefits) higher than the blue bar (% kids). The top two deciles (20%) receives little benefit due to the $150K cap, and the bottom four deciles are either roughly proportional or underrepresented in proportion to the number of kids they have. The broad distribution could be worse, but it certainly isn’t weighted towards the low-income families this credit purports to help. Figure 3: Proportion of benefits vs proportion of children by income decile. While upper middle-income parents will see the most benefit, they don’t get much in terms of actual money—on average $77/month for those receiving any benefit for young children. Median fees in Ontario cities start at $781/month (in Windsor for preschoolers) and hit $1,685/month (Toronto infants). The average increase in preschool fees between 2016 and 2017 in big cities in Ontario was $35 a month. These families will still face long wait lists and fees that are likely to continue rising faster than inflation. And these fees are far above the maximum ($667/month, or $8,000/year) one can claim, for those who qualify. So where does that leave Ontario parents with kids? Well, another tax credit doesn’t dramatically alter the general situation: fees in Ontario cities are among the highest in the country, are generally rising faster than inflation, and wait lists continue to be long. Tax credits are not likely to make child care more affordable—what would, however, is provincial governments (like Quebec, Newfoundland and Labrador, Manitoba, PEI, BC or Alberta) regulating fees and making up the difference in transfers to providers. David Macdonald is a senior economist with the Canadian Centre for Policy Alternatives. Follow him on Twitter at @DavidMacCdn. • A child care policy for the people? Probably not.